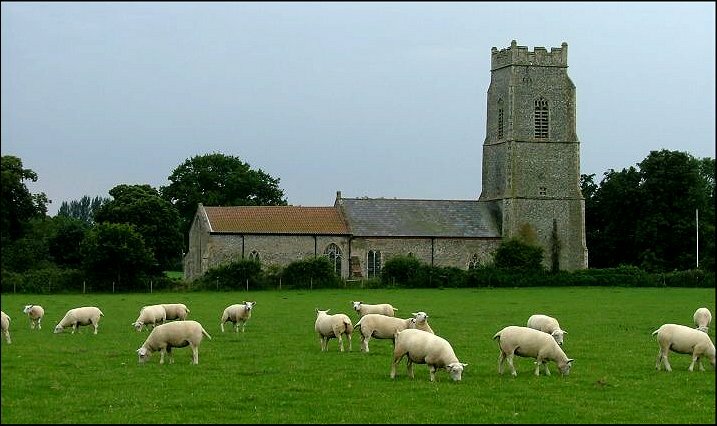 A person in possession of a decent Ordnance Survey map is never in want of knowing what the church tower in the distance is, but East Anglia has so many medieval churches that anyone without such a map can be confused. 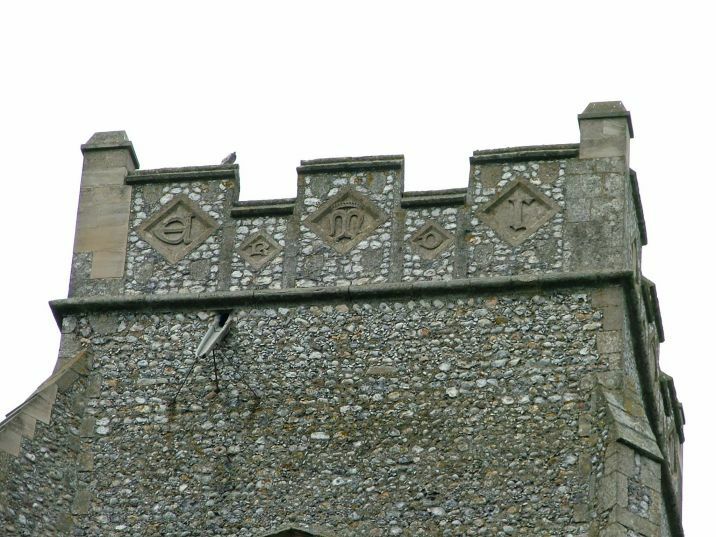 How helpful it is, then, to approach St Mary and see the letters ERPINGHAM lettered around the battlements of the 15th century tower! 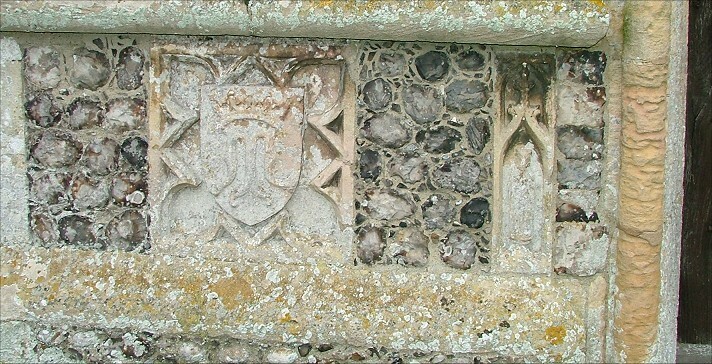 In fact, this is not a medieval attempt at a village sign, but a reminder that the bequest which paid for the tower came from a member of the Erpingham family - and to be fair to him, he also paid for Marian monograms to intersperse the letters. 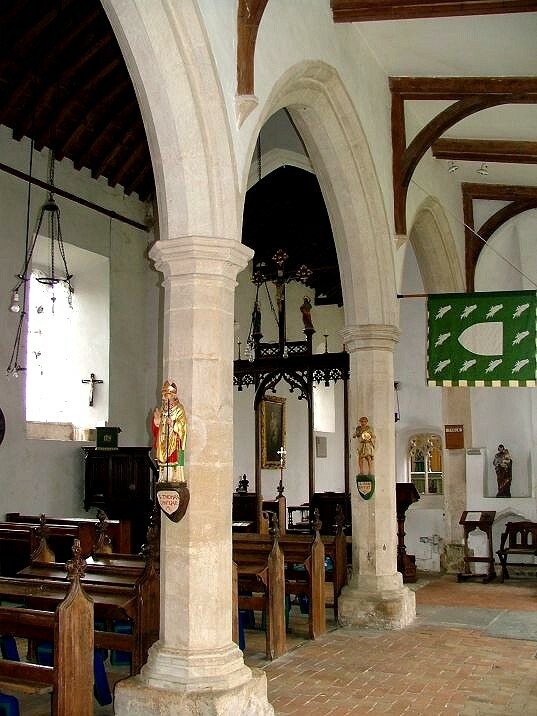 What a bold tower this is, and how long and low the 14th century nave and chancel look, especially seen from the aisleless north, without a clerestory. 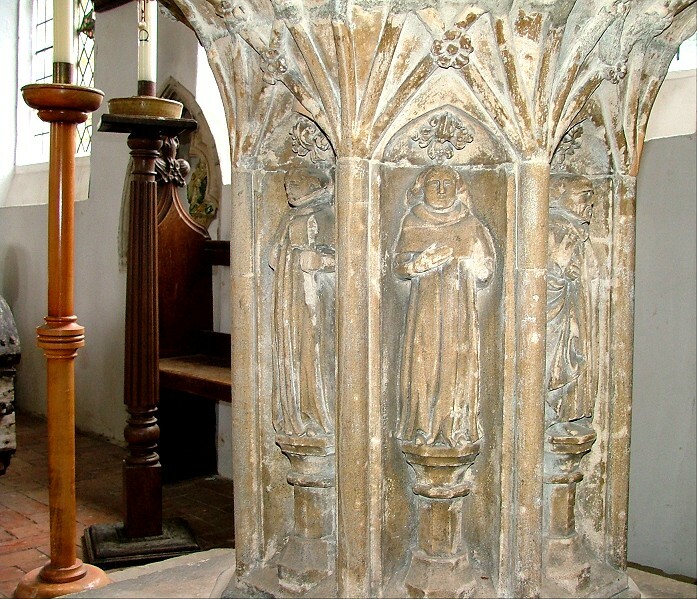 There is a delightful Annunciation scene in little niches either side of the west door. 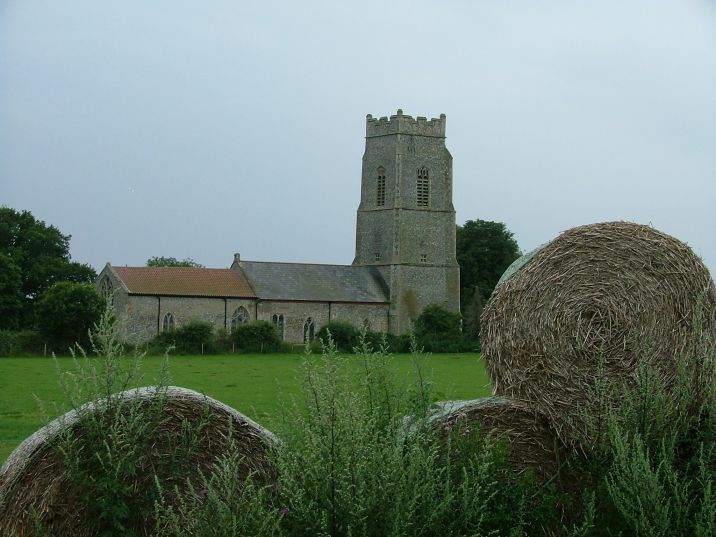 Erpingham is one of those special places you find in Norfolk. 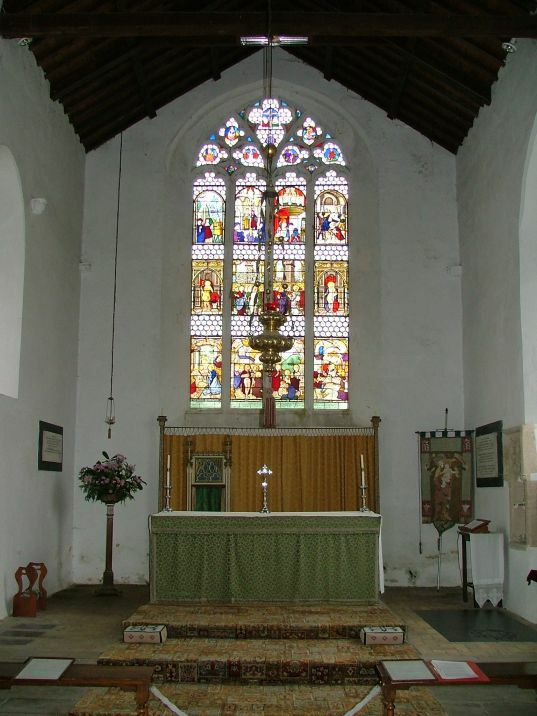 It has become a place of pilgrimage because it is a hotspot of the most vigorous kind of Anglo-catholicism; as at South Creake in the west of the county, it is a self-fulfilling prophecy. A medieval building stripped bare by protestants and puritans in the 16th and 17th century, little more than a preaching house during the long 18th century night, it was touched by the great 19th century wave of sacramentalism sent out from Oxford, and repopulated with the colour and drama of its original function in the early years of the 20th. 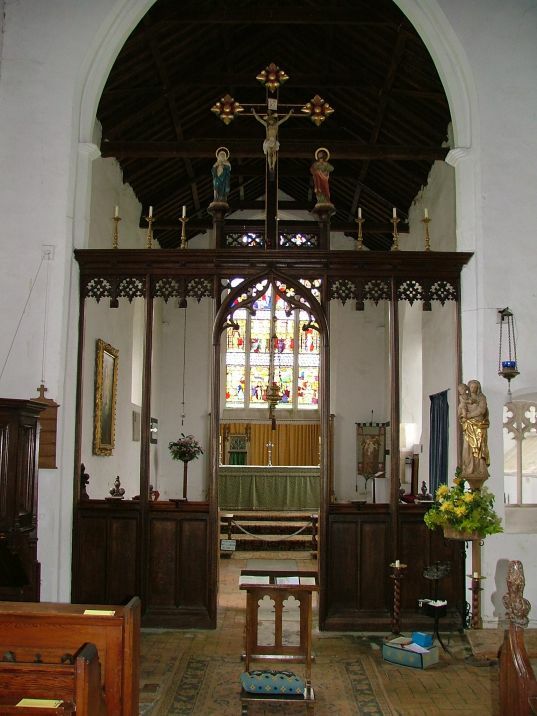 You enter here into the heart of the Anglo-catholic imagination. 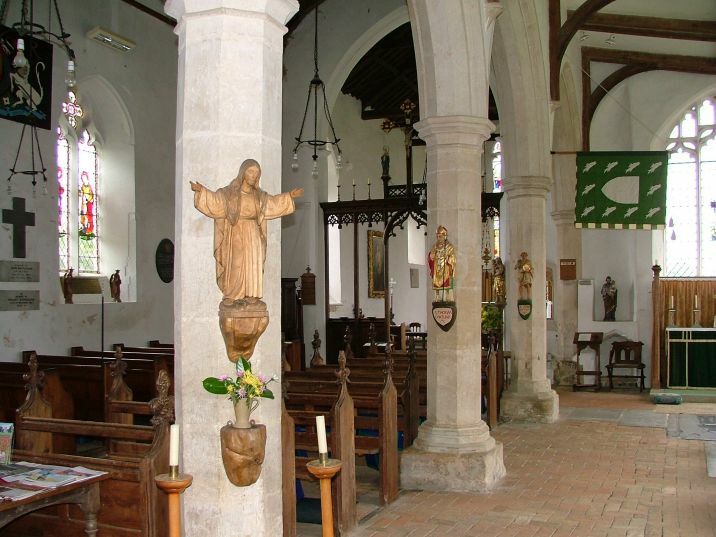 Stepping in from the south is curiously like entering South Creake; the aisle emptied of furnishings, the uncluttered nave with its simple Victorian benches, an understatedness offsetting the numerous devotional statues that line the arcade. 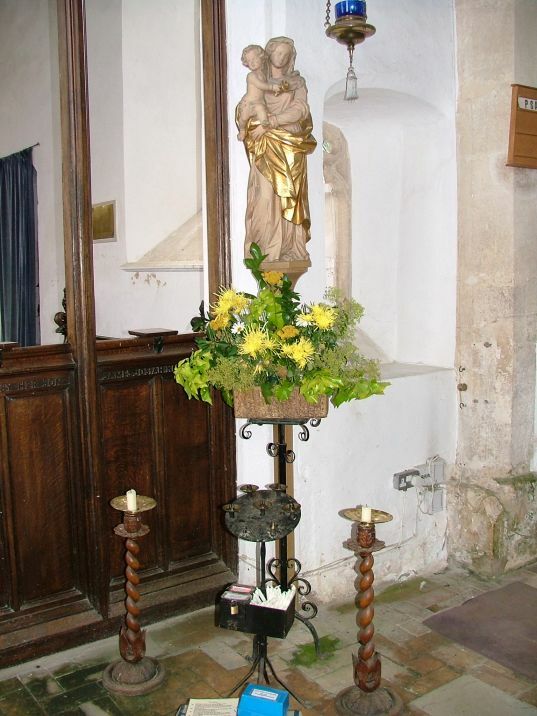 Urban Anglo-catholic churches can sometimes seem continental; but there is something very English about this place, its Marian devotion sympathetic to the rural setting, a reminder that the rest of the world considered England 'Our Lady's Dowry' in the days before Anglicanism. 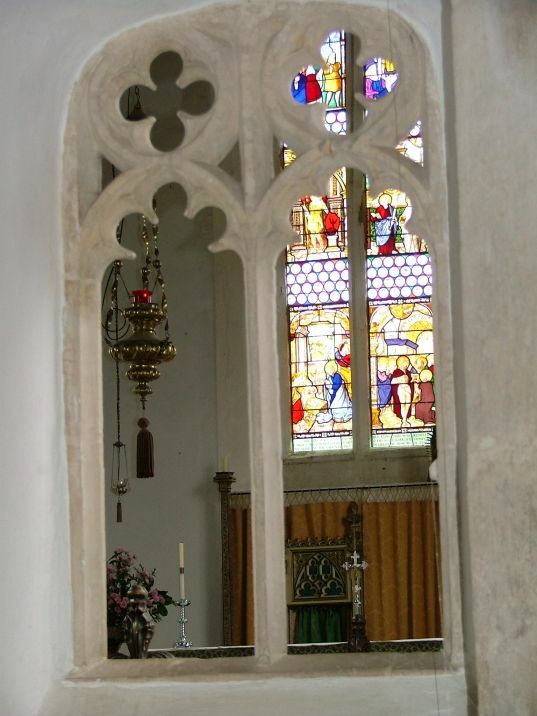 As I said, there is no north aisle, and there are more 19th century benches, these without poppyheads, against the north wall, reminding us that this is actually a small church. Although it would be an improvement to replace the benches with modern chairs, everything is simple yet beautiful, the setting for a good number of medieval survivals. 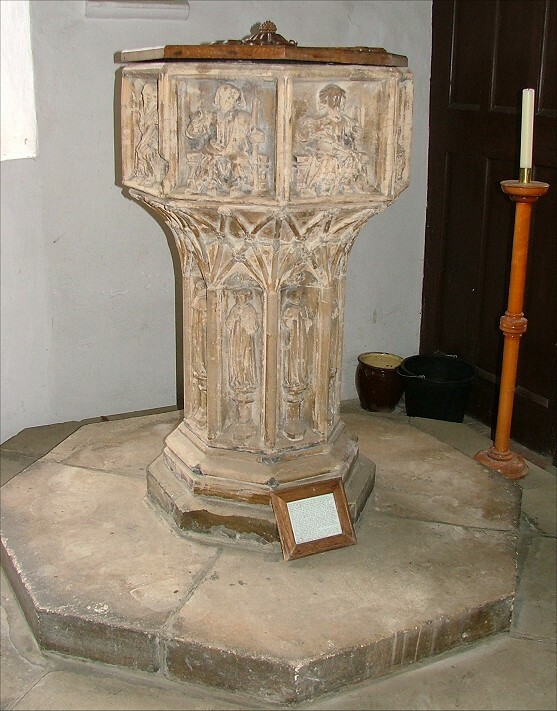 Pevsner tells us that the font came from the now destroyed church of St Benedict in Norwich. 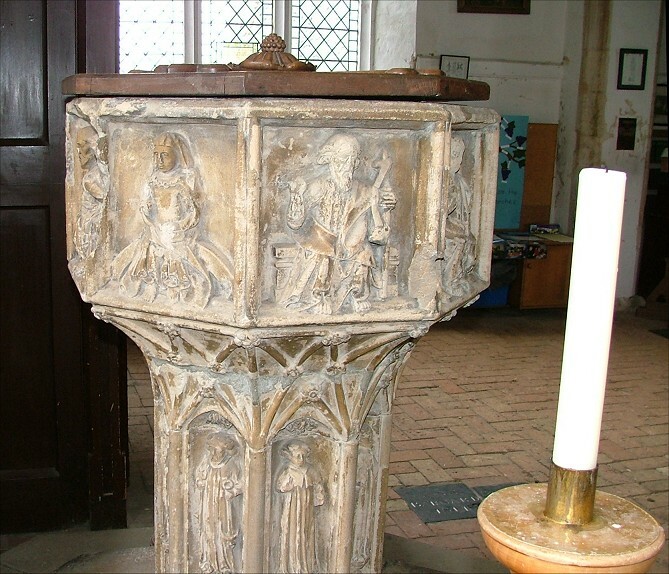 He also notes that it has been drastically recut, but it is still rather lovely, with standing figures in the stem and seated figures on the panels. 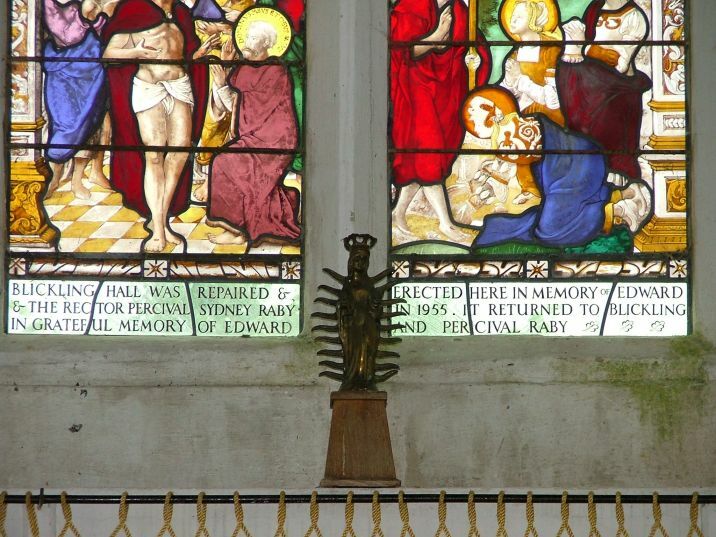 One of them apears to be Christ at the Last Judgement, now with the face of a woman. 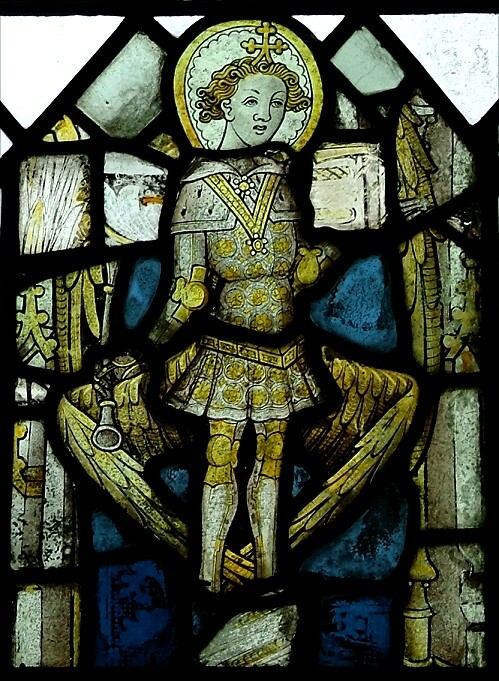 There are scatterings of medieval glass, including a typical angel of the Norwich school. 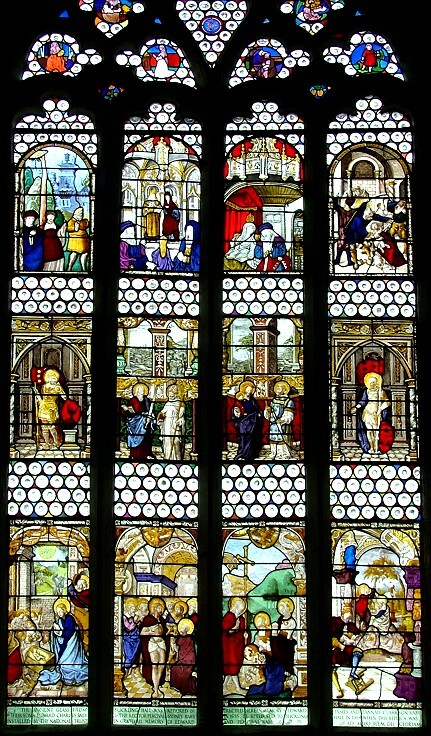 The east window looks rather odd; it is filled with what Pevsner says are modern copies of 16th century Flemish panels, which had been in place here from 1955. 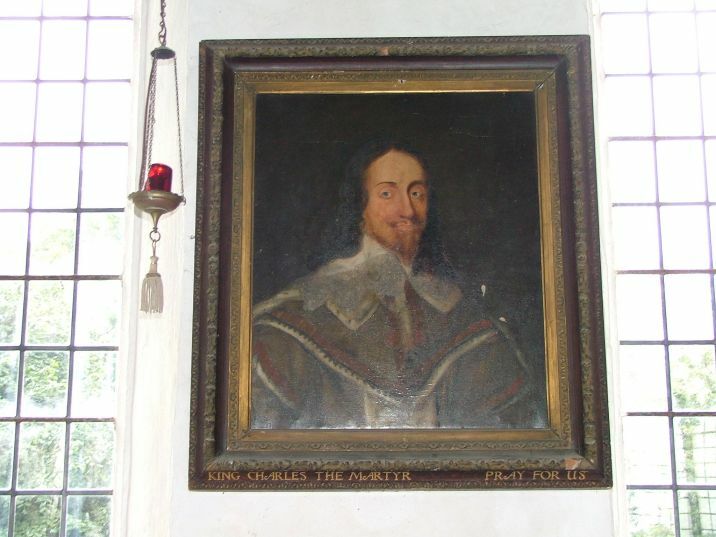 Forty years later they were returned to Blickling Hall, their original home, and these copies installed. I couldn't help wondering why they hadn't just left it clear. 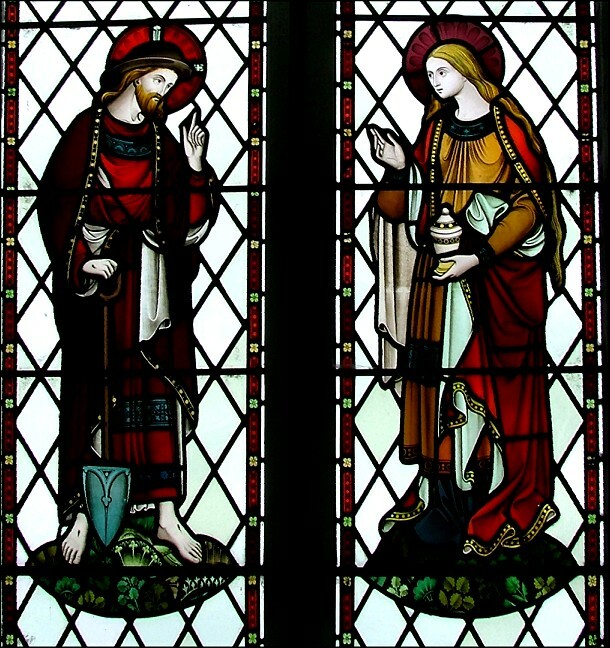 Best of all are the modern designs in the nave - my favourite is the gorgeous Madonna and child in the aisle, and there is also a super rendering of Mary of Magdala meeting Christ in the garden - he even holds a spade! I wonder who the artists were? 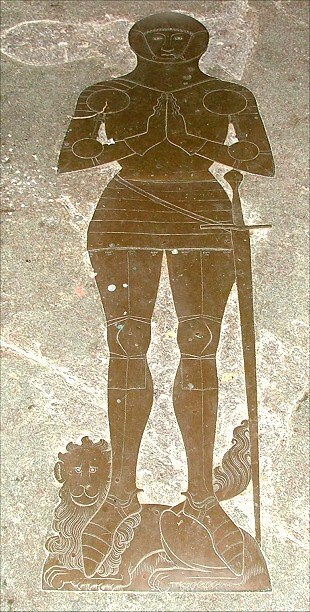 This church has one of Norfolk's most famous brasses, Sir John de Erpingham. 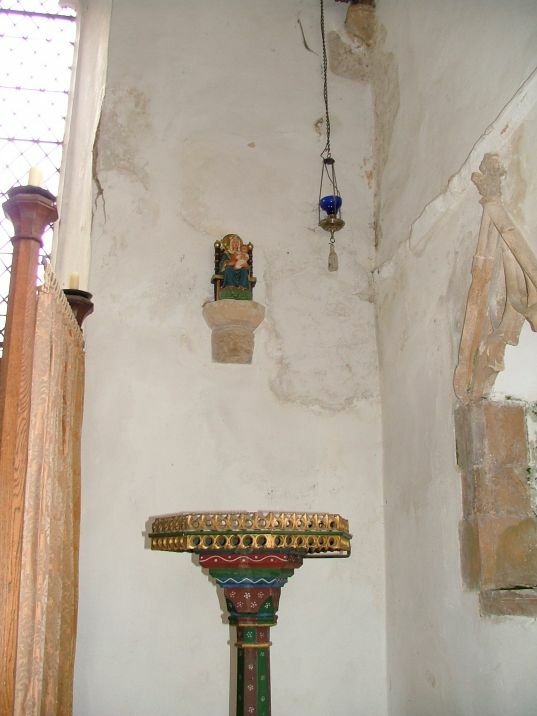 It is in the south aisle, not far from the badly eroded tower pinnacles which now rest here. 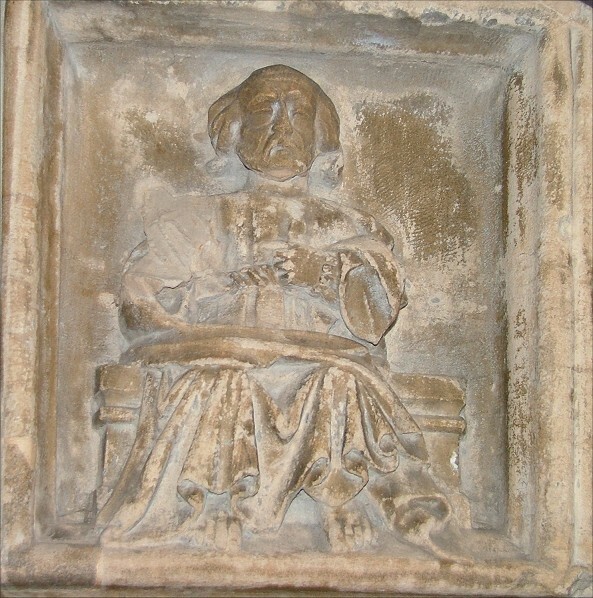 It dates from the first couple of decades of the 15th century, and shows Sir John in military uniform. It is easy to imagine him clanking around the bloodsoaked fields of Agincourt. 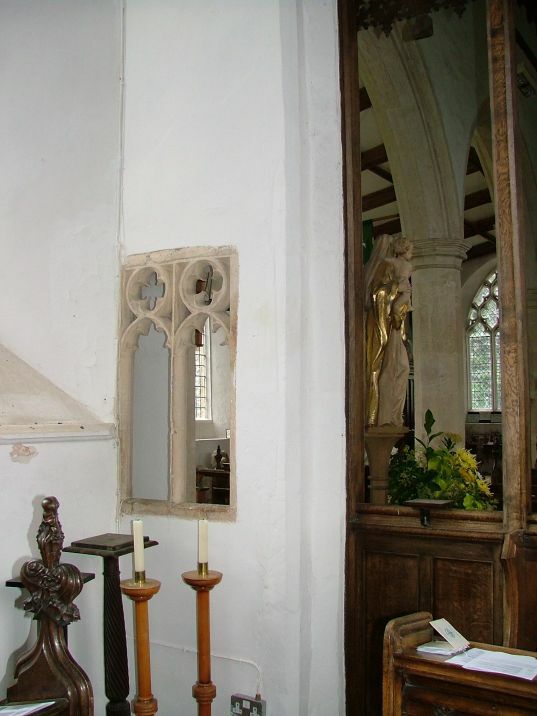 At the end of this aisle a large traceried squint looks through into the sanctuary. 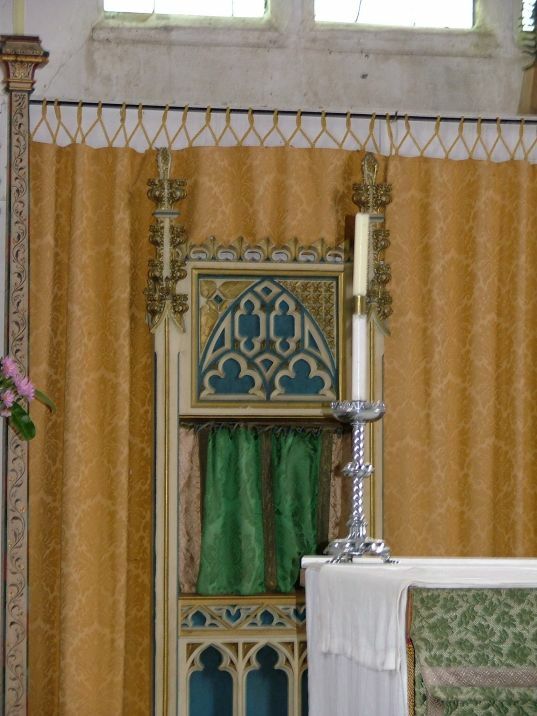 The modern tabernacle, which in the Catholic tradition should be immediately behind the altar, has been offset to one side so that it aligns with this squint for anyone celebrating Mass at the side altar. 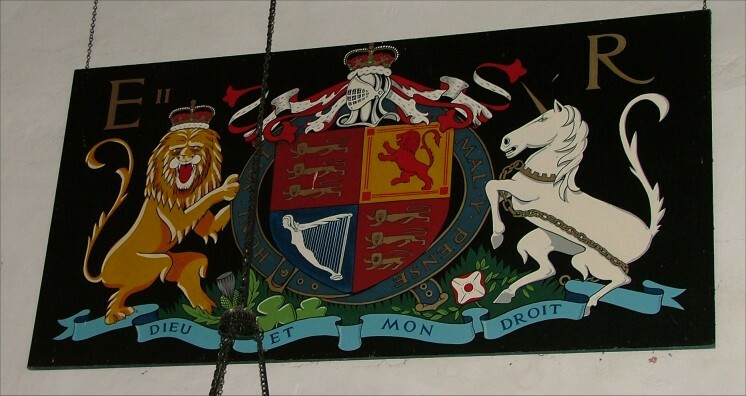 A couple of interesting curiosities are a set of royal arms for the current queen, and a shrine to King Charles the Martyr, which consists of an oil painting and hanging light. 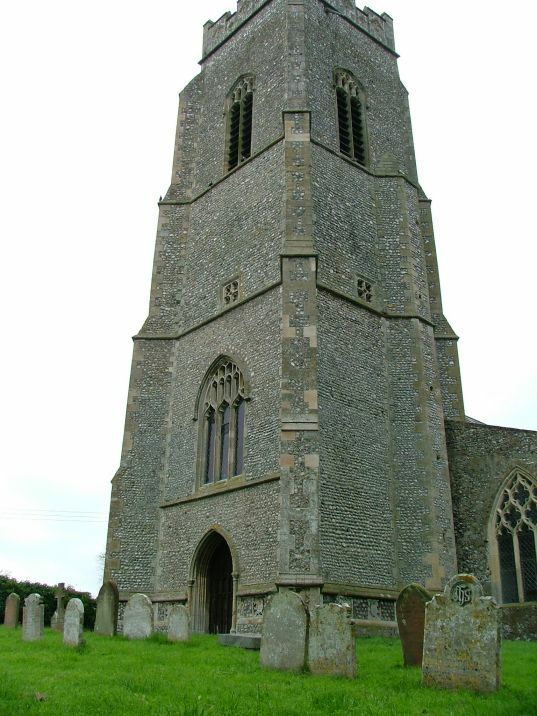 Living in Suffolk, where the Anglo-catholic tide has retreated almost completely, I always enjoy the in-yer-face spikiness of churches like this, of which Norfolk seems to have a fair number. 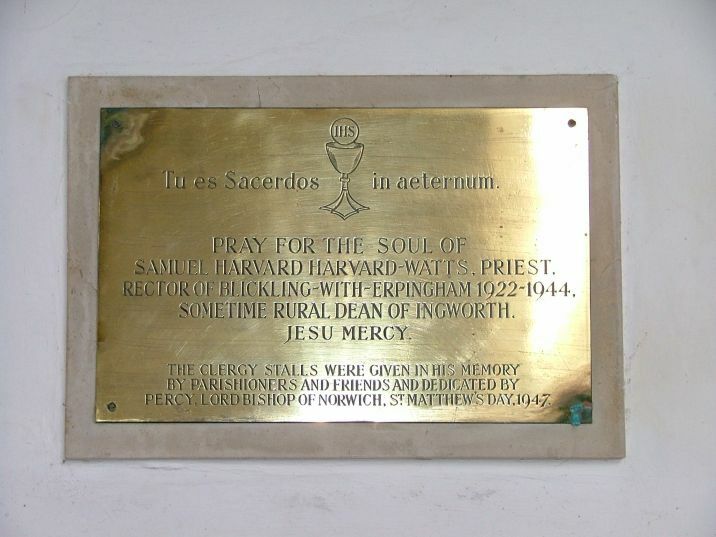 An example is the memorial brass for Father Samuel Harvard-Watts, incumbent here 1922 to 1944, who was presumably responsible for its character; it observes Tu es Sacerdos in Aeternum ('You are a Priest in all Eternity') and asks us to pray for his soul. 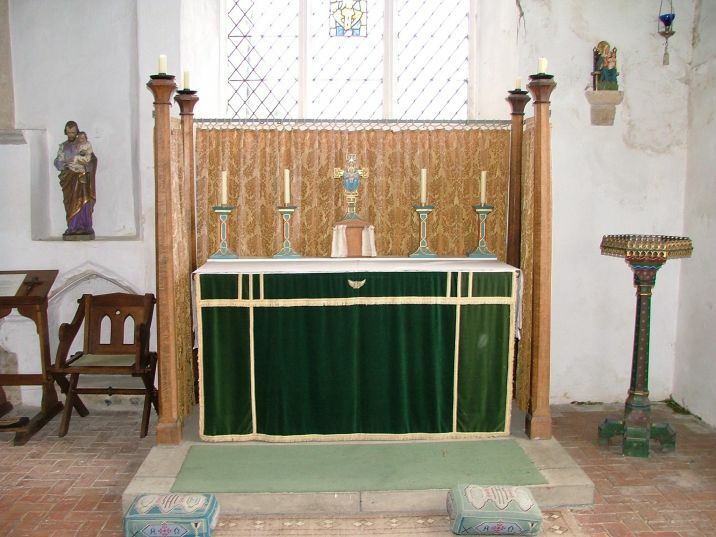 Also, this church and its sister at Calthorpe still unashamedly celebrate Mass (none of this wishy-washy 'Parish Eucharist' stuff) and not only that but Benediction on a weekday as well. 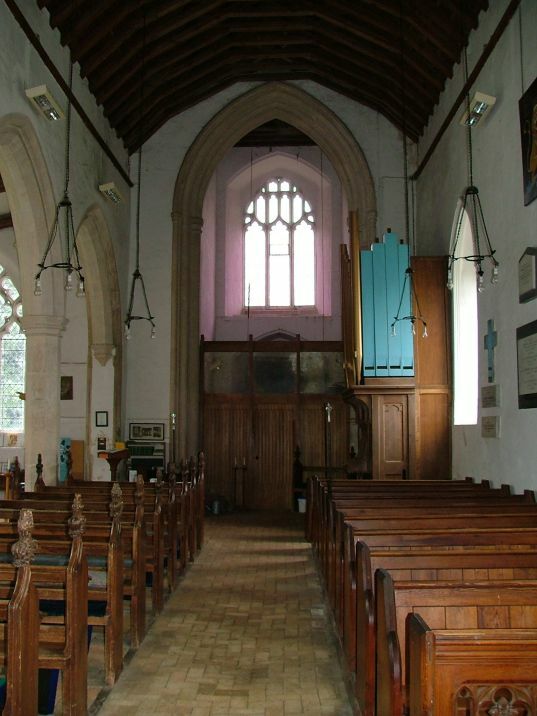 This church must be a veritable liferaft for like-minded Anglicans in this part of Norfolk.